Cheesecake Factory Chicken Madeira has everything you need. 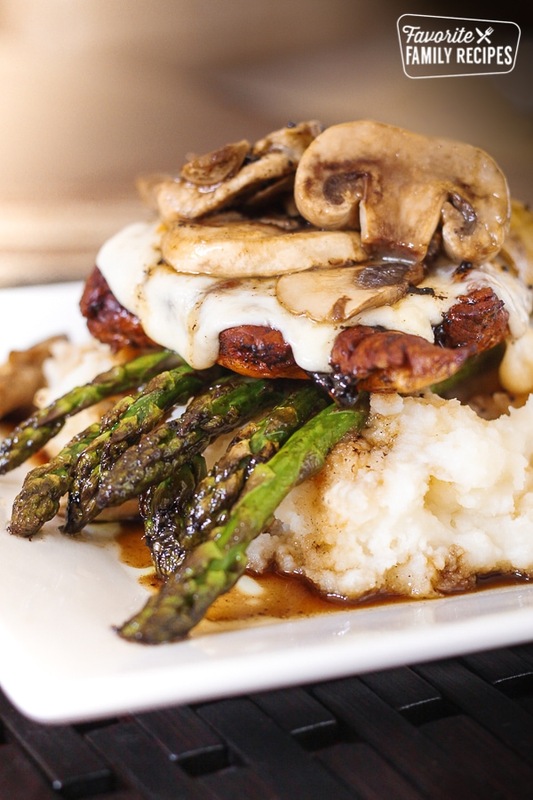 Chicken, asparagus, cheese, mushrooms, not to mention the incredible sauce that tops it all! If you have ever been to Cheesecake Factory, you know that their menu is HUGE! I can never decide on what to get because everything looks so good. When I am completely indecisive my fall-back menu item of choice is the Chicken Madeira. When I had this recipe for the first time my thought was “I can duplicate this”! So a few days later I went home and tried. When I opened my cupboard I didn’t have any Madeira cooking wine on hand and I didn’t feel like going to the store to get some.. so I improvised. The second time I made this recipe I did it with the Madeira wine and to be honest… I liked it better with my balsamic/beef broth creation better! Of course you can do it the “right” and do it with wine instead of beef broth. It is completely up to you. When I posted this recipe before (back in 2008) I actually named this dish “Balsamic Asparagus Chicken” but I decided to re-name it “Chicken Madeira” because that was the taste I was going for and what I was trying to duplicate (even though technically it doesn’t have any Madeira in it). You are going to love this recipe. It is so fancy looking, but actually REALLY easy to make! It is definitely a guest impresser (if that is even a word…). Place chicken between 2 pieces of Saran Wrap and pound until it is about 1/4" thick. Place chicken in a ziploc bag, place bag in a bowl big enough to hold the chicken. Combine marinade ingredients and pour in the bag. Squeeze all the air out of the bag and refrigerate for about 2 hours. About 20 minutes before chicken is done marinating, heat oil in a large skillet. Add mushrooms and saute for a couple minutes. Add remaining sauce ingredients, bring to a boil, then reduce heat to a simmer, uncovered, for about 30 minutes or until sauce thickens and reduces to about 1/2-1/4 of it's original volume (when it is done, the sauce should be dark brown in color). While the sauce is simmering, place chicken in a lightly greased glass dish and bake at 400 degrees for 15-20 minutes (or until chicken is cooked through). You can also grill the chicken at this point which tastes awesome too! While chicken is baking prepare the asparagus buy sauteing the spears in some butter or oil until crisp-tender. Remove chicken from the oven (or grill) and layer on one slice of provolone cheese, a few asparagus spears, then one slice mozzarella cheese on each piece of chicken. Set the oven to broil and broil for about 3 minutes or until cheese is melted and starts to brown a little. Right before serving, spoon some of the sauce over each piece of chicken. Serve with mashed potatoes. Oh yumm, ladies! I, too, just love going to The Cheesecake Factory! My fall-back order is the Miso Salmon…have you ever duplicated that one? Coudja, woudja? I’d love to do that one at home, but I’ve never used miso or very many Asian ingredients. Thanks for this lovely chicken recipe! Can’t say I have ever tried the Miso Salmon! Next time I am at Cheesecake Factory I will have to try it out… I love salmon and I haven’t gone wrong with anything I have had at Cheesecake Factory so I am sure their salmon is divine. Thanks for the heads up! I have had miso soup a few times so I am curious to see how miso pairs with salmon. Thank you! We tried this last year before your comment and it was awful. Nothing like the restaurant. Now we’ll have to try again! I remember Cheesecake Facrory’s original sauce recipe which included a veal reduction. Would love that recipe! I have tried this recipe using balsamic vinegar and balsamic vinegarette. I agree that the balsamic vinegar is too strong in this recipe. It is much more balanced using the balsamic vinegarette. Delicious dish! Can you use chicken thighs instead? chicken maderia is the BEST dish at Cheesecake!! haven’t been there in ages, will have to try this recipe out 🙂 so happy!! This was awesome! We grilled the chicken and it turned out super moist and flavorful, and the sauce was so good with the mashed potatoes! I am sure it will totally be fine! Hope you like it! Follow-up! I made this last night for my boyfriend’s birthday. It was my first time cooking for his mother, to add to the pressure. Well, it came out GREAT! Made me look like I can cook 😉 Thank you SO much for sharing this recipe. PERFECT! Is that mashed potatoes on bottom then asparagus? Picture doesn’t match recipe. Whoops! The old picture was the “right” way… Either way it tastes great! Would like the recipe for white chocolate macadamia nut cheese cake from the cheesecake factory . Has anyone tried to duplicate? I made this the other night and it was wonderful! I would love to publish my adaption of this recipe on my blog if that would be alright with you! Sure, just say adapted from Favorite Family Recipes with a link back here. I’m in the process of making this right now and had a couple questions. The sauce is currently simmering right now and I tried a little taste of it and wasnt to fond of it. It tastes very acidic from the balsalmic vinegar. Is this something that will go away during the process of cooking it through? its been on the stove for 20 minutes now. The taste of it wasnt too good. I was wondering if you can help me out on this one. It is supposed to be a little acidic– it balances out well with the potatoes. If it is TOO acidic for your taste, add a Tbsp. of brown sugar.. continue adding until you get your desired taste. Made this tonight. Every thing was picked up at Walmart. Nothing fancy. It was excellent. I did only have half the chicken but made the whole recipe of sauce. People were talking about licking their plates. Excellent! Thank you. I did taste the sauce part way thru the cooking process. Not so good but was excellent once thick. My husband doesnt eat beef what can i substitute for beef broth? Chicken broth would work fine, or even vegetable broth. Good luck! Ooh yum! You are going to LOVE it! Lucky you to have a cook for a son! Not sure what we did wrong since all the reviews seem to love this, but we made it and it was awful. Way to much balsamic. Waayyy too much! Didn’t taste like Cheesecake’s at all, and my SIL and I know because it’s our favorite meal. How much oil do you need to sautéed the mushrooms? Although I tend to love the flavor of Balsamic Vinegar, I was a little nervous as poured tons of it into the recipe. I became even more nervous at the overwhelming vinegar smell as it simmered. But, when it was all put together, it was delicious and well balanced. For the asparagus, I tossed it in oil with salt and pepper and put it in the oven with the chicken (on a separate pan)– both for 25 mins @400. Overall, the meal was very tasty. At times the taste reminded me of red beat eggs, I’m assuming it’s the vinegar. Yay! So glad that you liked it! It definitely tastes best after the vinegar has reduced 🙂 I’m glad you stuck with it to the end! I have made this several times now and each time has been a complete success! My husband loves mushrooms, and I don’t cook with them very much, so the abundance of mushrooms alone made him happy 🙂 I love how fancy this dish looks and how much flavor it packs! We are huge balsamic vinegar fans, so the pronounced flavor wasn’t an issue. If I was making it for people who might find it too strong I’d probably do 1/2 c. vinegar and 1 1/2 c. broth in the sauce. I do half the marinade and it’s always plenty. Today I had broccoli on hand, so I roasted it with the chicken and used it instead of asparagus. It worked great. Oh, and I’ve never had the “original” so I can’t compare the two, but this is one yummy dinner! A lot of it depends on your balsamic vinegar– you can always use Madeira wine if you don’t like the vinegar-y flavor or you can use more beef broth and reduce it longer. Hope this helps! I have to first say that I have never had the Chicken Madeira at The Cheesecake Factory so my rating is not based on comparing this recipe to that. I made this for dinner last night. I really enjoyed it, but my husband thought that the sauce was too strong. He just used a small amount. I grill the chicken and think that that added a nice flavor to the dish. I also added 1 teaspoon of cornstarch to the sauce after it was reduced. That made it more like a glaze. The only thing that I would change the next time, is that I would not leave the mushrooms in the skillet while reducing the sauce. It made the mushrooms have way too strong of a vinegar taste. I would sauté them, remove them from the pan and not add them to the sauce. Just spoon them over the chicken stack after it comes out of the broiler, then top with the sauce. Thank you for your comment! The sauce is a bit strong, you can definitely scale back on it if you prefer! Same with the mushrooms, if you don’t like the strong taste you can absolutely just saute them separately. Thanks for your suggestions! So glad you liked this recipe! I’m sorry but this recipe tastes nothing like the cheesecake factory’s. The sauce came out to be like a sugary glaze it was too sweet. I will definitely use the Madeira wine next time.